Please join us for the Februrary Breakfast. During this breakfast we'll have the opportunity to learn more about the plan to make the Village of Rhinebeck an Autism Supportive Community. Anderson Center for Autism and the Village of Rhinebeck will be in attendance during this event. 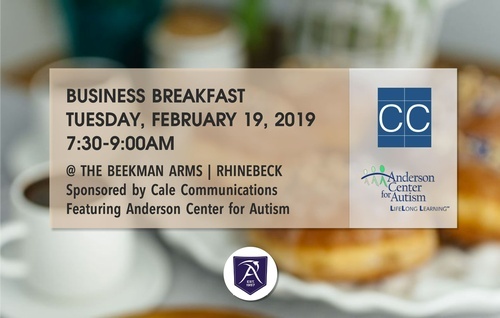 Anyone who attends the February 19th Rhinebeck Area Chamber of Commerce Business Breakfast will no doubt leave feeling very inspired; Anderson Center for Autism staff will shed light on what autism is and how to support all who are impacted as the Village of Rhinebeck works to become an Autism Supportive Community (ASC). For those interested in being part of the Village of Rhinebeck ASC initiative, a one-hour training will follow the breakfast which will give participants an overview of exactly what modifications they might consider making to their operations or facilities to gain designation as an official part of the Village of Rhinebeck Autism Supportive Community initiative. Those businesses who pledge to do just one thing to help this population, and who deliver on that pledge, will receive formal recognition noting their participation in the project and will be included as part of a roster of businesses listed on the Chamber website on a special web page sponsored by Dave's Tree Service for "Autism Supportive Businesses." At Cale Communications, co-owners Tom and Marybeth Cale ensure that clients have everything they need to communicate and connect with confidence. From creative writing, media relations, and public relations services to compelling website design, logos, and ads, they love developing and executing campaigns that will position clients for success. They've also been co-publishers of Living Rhinebeck magazine for almost 3 years, which offers another unique opportunity for businesses to reach their target market. Cale Communications is sponsoring this event on behalf of Anderson Center for Autism, who is both a member of their client family and an important part of their community volunteer efforts. Marybeth serves as Secretary of the Anderson Foundation for Autism Board of Trustees, along with serving as PR Chair for the Foundation. And about two years ago, Tom developed a weekly volunteer art program for residents of Anderson which he has been running ever since. Both Marybeth and Tom are also volunteering their time and services to support the Village of Rhinebeck Autism Supportive Community Initiative. They love living and working in Marybeth's hometown and are grateful for the ongoing support of the community. Learn more about their capabilities at www.calecommunications.com. Anderson Center for Autism offers educational, residential, and vocational training programs designed to maximize potential for people with Autism. Their mission is to optimize the quality of life for all impacted by the neurological disorder. Whether onsite at their Staatsburg campus, out in local communities through their consulting program, or in countries all over the globe through Anderson Center International, the Anderson team is highly respected by industry leaders for their commitment to evidence-based practices, for their nurturing, expert professionals, and for their unwavering focus on the strengths of every individual they serve. Learn more at andersoncenterforautism.org. The Beekman Arms is the perfect host for this event because they recently completed training with Anderson Center Consulting to become an Autism Supportive Environment℠, demonstrating their commitment to providing a welcoming, supportive experience for families impacted by Autism Spectrum Disorder.